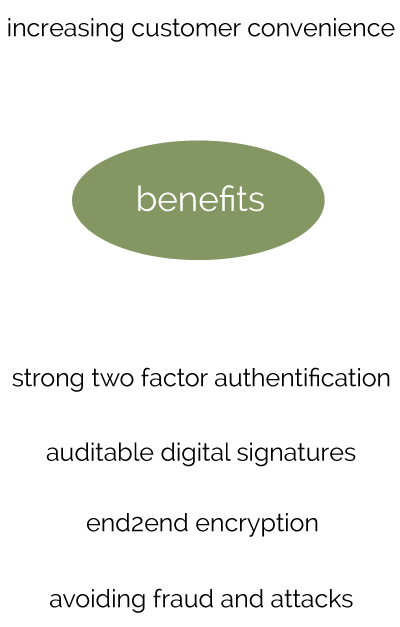 Seal One enables banks and other organizations to implement a strong authentication and digital signatures scheme with their end customers. With Seal One you will give your customer a user friendly, easy to use and high secure mechanism and get rid of all the outdated and insecure TAN based systems. The Seal One solution is increasing security and customer convenience at the same time. The portfolio including software and/or hardware for end customers enables banks and other organizations to adopt a cost effective risk based solution where it is possible to choose which parts to adopt based on the individual needs. Straightforward integration to existing workflows by reuse of existing components and platforms using the Seal One API provided to the partner.